A few days back, I was selected to be one of the selected few to review the yet to be launched Tata Motor's latest iteration of Indica Vista, the Indica Vista D90. I was fairly skeptical of the car. The last time I had driven it, one, I was scared by the enormous look of the car from inside and two, I was just a learner at driving the car. Given these facts, my wife was super tensed if I would be able to drive the car at all. 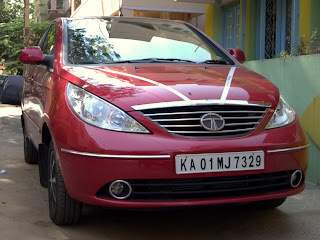 The car was delivered to me at work and I had been accompanied by Avi and Madhu, my closest friends so far. At the first look of the car, I did no find any change to it. At least not on the exteriors. However, Tata Motors could not have been expected to be sitting idle, isn't it? Just as I was introduced to the interiors of the car, I was blown out of my mind! 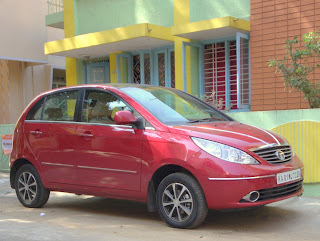 This was not the regular Indica Vista that I had test driven! That was oh so run of the mill! But this? This was car extraordinaire! The dash, the space and the entire geometry was different! It was absolutely great! The real package however lay silently grunting at my ignorance under the hood! The 90ps engine was silently purring in idle like a lion licking it's paws before a hunt! Once on the driver's seat, it felt reassuring to be in complete control. The tilt adjustable steering and the six way adjustable seat was really good for a tall person like me. I did not find the lumbar support too much to my liking. May be shorter folks would appreciate it. I found it placed too low for my lumbar region. 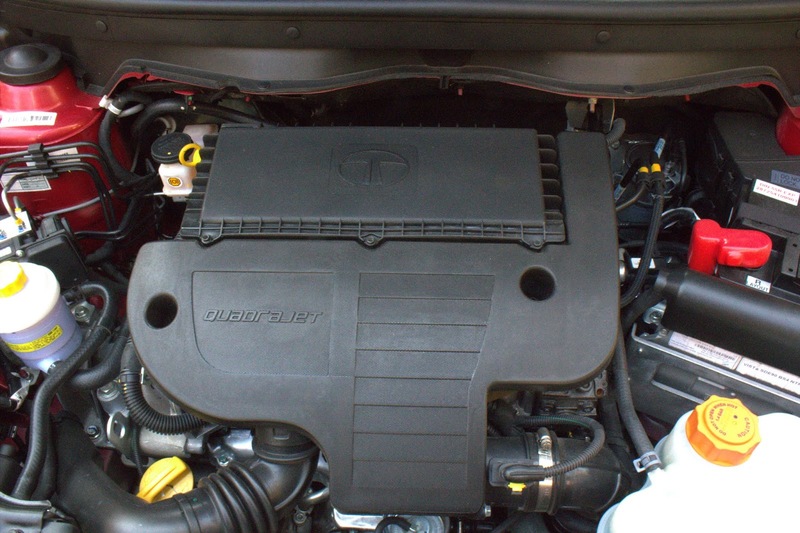 The engine in its new avatar was peppy and lively. It has in fact been improvised to the extent that it was actually possible for me to go from absolute stop, 0 kmph to 100 kmph in less than 15 seconds. I had the car with me for three days in all. I performed various tests that I felt would be good for me in case I decided to buy this car in the future. I was told that the car doors have been reinforced with extra steel to make it a lot more road hugging kinds. I thought may be it's just a sales pitch. I generally travel with my friends to work in a car pool. But then on Thursday evening, I was alone on my way back. I put the reinforced steel pitch to test. I got the car to go over a speed breaker at a speed of 60 kmph hoping to get the unsettled feeling. In general, when any car has to go through this, the first reaction is that of a suspension bounce before it can actually come back to normal. But in case of Indica, this was not the case. The car settled back to normal like it never went over a speed breaker ever. 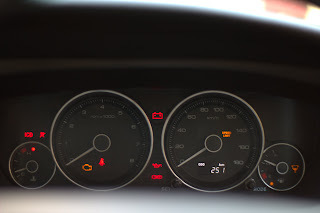 The car has a top speed of 158 kmph as shown on the speedometer and I was told this was not under test conditions but under actual run conditions. I felt it was not really possible and had to be tested. On Thursday night this was tested as well. I was literally cruising at a speed of 160 kmph on NICE Road! To add to that, the car, still remained nimble enough to allow easy maneuvering! Cornering is absolutely refined and perfect. I was easily able to clear the curves at a speed of 120 kmph - 140 kmph without any kind of trouble or fear. The Quadrajet engine is an absolute engineering marvel in itself. Now enough of the engineering stuff and the exteriors, lets move on to the interiors. 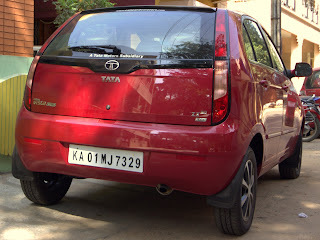 Tata's cars have been known since ages to be family friendly cars. This was absolutely evident from the pleasure that was evident on my family's faces when the 6 of us, 5 adults and my 2 year old daughter went out for a drive! My daughter so very fell in love with the roominess of the car that she wanted to play in it! The car for sure got a lot of kisses from her! she loved the feel of dash board and the seat fabric used. 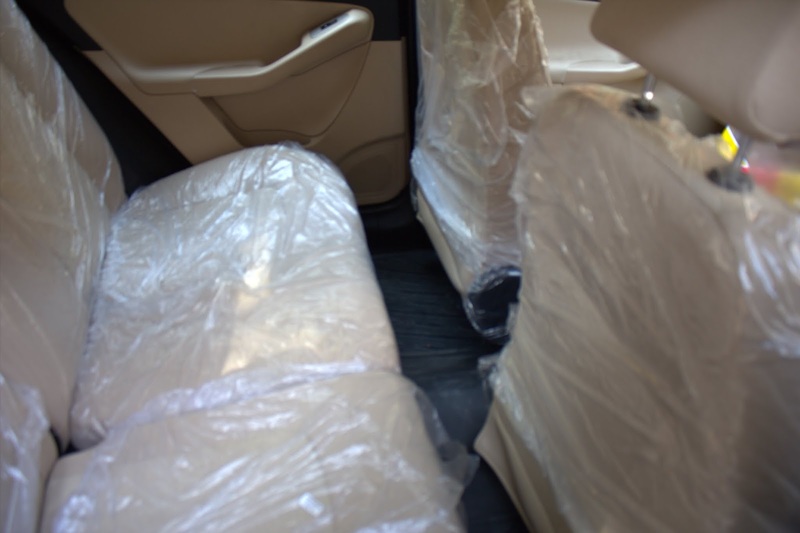 The space that is available on the back seat is also very commendable. I generally drive with my seat (Driver's seat) pushed to almost the entire back. My brother who is nearly as tall as me was seated just behind me. The leg room that he got never felt compromised, and later when he was tired of being seated straight, he decided to relax a bit and sit cross legged. Let me tell you a bit about my family here. None of us are slim and trim. All of us are on a well built and bulky side. 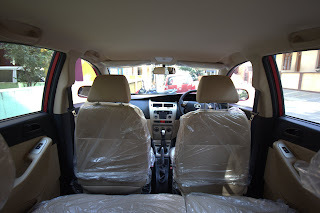 On the co-passenger's seat was my wife and on the back seat was my Dad, Mom and Bro. Generally with a person sitting cross legged in a car every other person sharing the back bench would definitely be inconvenienced. But here that was not a case to be. There was enough space to allow any one to sit the way he chose! I would definitely not consider the car to be fully loaded in such a case, I have loaded my i10 a lot more than seating just 5 people. I have loaded it with luggage and traveled longer distances. However, with Indica, here I had the grouse that the car almost decided to settle down to a crouching stance. The car grazed quite a few speed breakers on the way. This was absolutely not as per my liking. The car should have enough ground clearance for almost any kind of a road. And given Indica is a car made in India for the Indians by an Indian, this should not have happened. 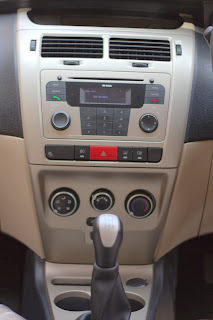 The dashboard, I was told, has been borrowed entirely from the Manza and so has the front end of the car. This definitely adds a lot of value to the car. The dashboard now includes an informatory Driver Aid system, a driver console right in front of the driver (unlike the previous Indica which had it in the center), a bluetooth enabled music system and a set of steering mounted controls. The driver aid system provides the running fuel mileage, an instant fuel mileage and a kms run since last full tank. I think this provides enough information to the driver to estimate and drive in either an economic way or a sports mode way. It also allows to plan ahead in case a long drive is planned. 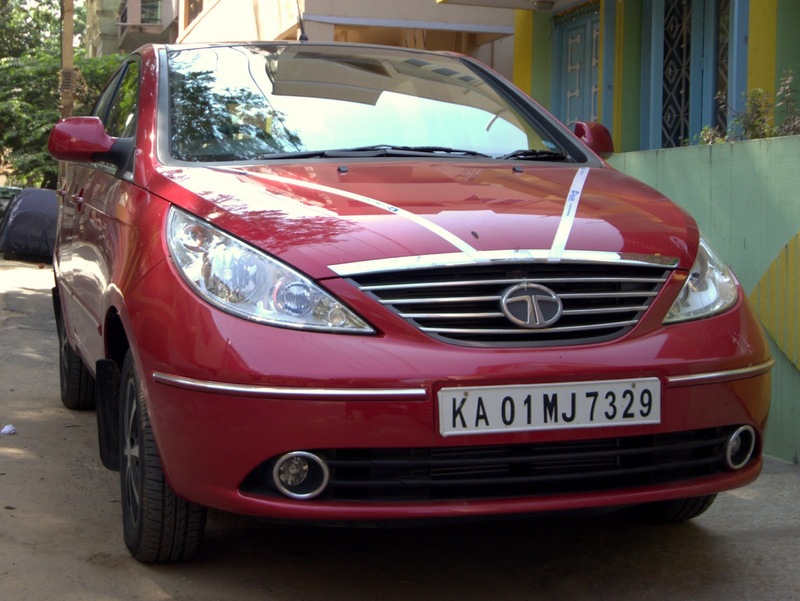 I was told that the car would give a mileage of 25 kmpl under test conditions. 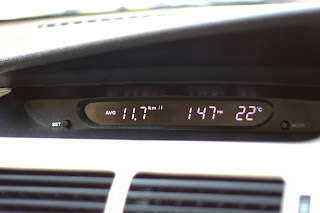 However, I was also told that under real world conitions, the car was supposed to return a mileage of at least 17 kmpl in a city run and at least 22 kmpl in a highway run. My commute to work involves a mix of both and I know well that I did not drive it in a sedated driving style. I was constantly tempted and prodded by the car to push it to its limits and go overboard in terms of speeds! The expected fuel mileage that was displayed was that of approximately 12.3 kmpl when I last handed over the car. I did not find the steering mounted controls to be too good either. I found that they were slightly wrongly placed and were too small for my fat and chubby thumbs. I accidentally hit the seek button several times. The choice of dashboard although appearing premium on look definitely has a slight plasticy feel to it and feels loose and easy to come off at several places. The choice of color of being exactly black also has its negative effect of being too easily reflected off the wind screen and being distracting. The in car rear view mirror really does not lend too much of a support and is nothing more than a rear view conversation mirror. I could hardly adjust it to see behind on the road. The ORVMS are not too helpful either. I would have definitely preferred them slightly bigger. That would have more than compensated for the near lack of a functional central rear view mirror. 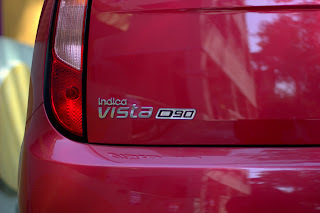 On the driver front, Indica was one car that I always thought had a dead pedal next to the clutch or at least enough space to take the left foot off the pedal and rest it once we were in the cruise mode with no more gear changing. This however has not been thought off in this car. The driver has to take the leg off the pedal and place it either before it or under it which is definitely not safe. In the next iteration I would definitely want to see this incorporated. Another thing that I would definitely want to see in the next iteration is the co passenger seat being either lower or height adjustable. I hit my head on the roof several times when I was seated on the co passenger seat with my friend being in the driver seat. 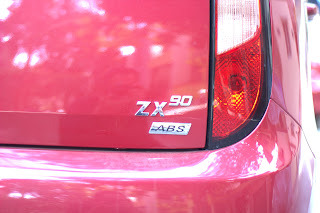 To summarize, This is what I loved and loathed about the car! The new split colour body! The roof was black in the model I had. The powerful AC! It cooled the entire car and made it like the inner of a fridge really fast! The engine growl! Sounded just like out of EA Games' Need For Speed franchise! The quality of materials used in the dashboard. Lack of ample head room for co passenger. The ground clearance which could be improved really! The lack of ample cubby hole spaces to keep all my stuff! All in all, the car is an excellent package with both positive and negative points. 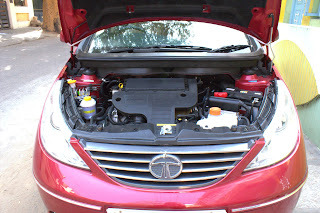 I am sure it would be a deal clencher and a perception changer for Tata Motors this time around! Here are a few pics of the car. The entire album can be found here. This review was done as a part of Blog Adda's Product Reviews Program! You can also get to review new products, just get in touch with them at the link above soon!